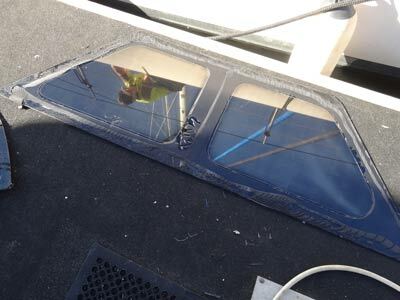 When we purchased Catlypso in 2014 we knew that at some time we would have to do some work on the windows as the adhesive holding them to the deck was starting to crack etc. We did minor repairs by patching them, but since our return from our 2015 Queensland trip, the leaking has got worse. We made preliminary arrangements in late 2015 to have the manufacturer of the yacht, Lightwave, do the work in late 2016. We finally set a date for this work, so we of course had to sail Catlypso from Sydney to the Gold Coast for the work to be done. The following is about that trip. We get up at 0600 and leave home at 0650 and head to the boat ramp at Yowie Bay. We take a load out to Catlypso using our small dinghy and then use Thunderbird 2 to tow it back to the ramp. Kelly helps me put the small dinghy on the roof racks of the Prado and I then take her back to Catlypso with the rest of our things. I head back to the ramp and leaving Thunderbird 2 at the wharf, I drive home. Our neighbour Gerard drives me back to the ramp. Once there, I take Thunderbird 2 back to Catlypso and haul her up onto the davits. Meanwhile, Kelly has prepared Catlypso for departing. Over the past week I have taken a lot of food, water and fuel out to Catlypso. 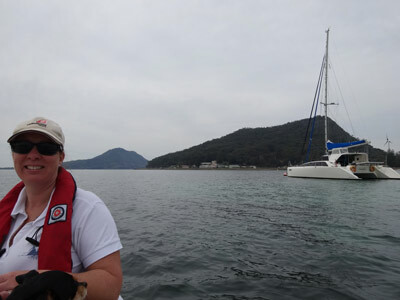 We head off at 0825 and Kelly logs on with Marine Rescue Solander (where we do volunteer radio duty) for our first leg to Broken Bay. There is no wind, so we have to motor. We have one engine on at 2400 rpm which is giving us 5.5 knots. The starboard engine v-belt (the one for the alternator) is slipping so the tachometer is showing no revs. We have to use the port engine. This is a bit annoying as back in May I had to replace that belt when it broke. At 1020 we pass Botany Bay and pull out the screecher. We have 8 knots of easterly wind so we gain about 0.25 of a knot. Around this time I realise that the chartplotter time is still on daylight saving time, so the estimate of our arrival time at Broken Bay is one hour later than it really will be. I fix this up. 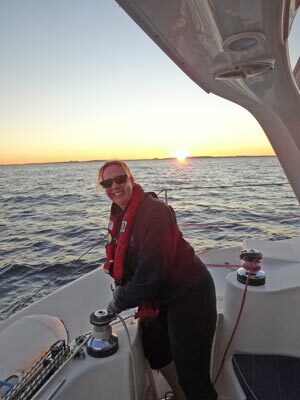 At 1215 we pass Sydney Harbour and Kelly checks in with Marine Rescue Sydney as we planned. We are now out of the current from the north so we pick up speed to 6 knots. Later we are doing around 6.5 and even hit 7.8 knots once. The seas are very calm with rolling south-east and north-east swells and the wind still very light. At 1455 we enter Broken Bay and log off with Marine Rescue. At 1520 we hook onto a public mooring at Coasters Retreat (The Basin). This mooring is on the western side north of the camping area and close to a small beach. As we came in we saw another Lightwave ahead of us, but we could not see its name. Once moored, I have a look at the starboard engine. I finally appear to be able to tighten it, but it is at its maximum. Not an easy job. We then took Veto to shore for a run. We of course stay below the high water mark, as above is national park. There are quite a few wallabies in the camping area. When we go back to Catlypso, I use Thunderbird 2 to go around Catlypso and using a broom, I clean the light “fur” off the hulls. Once this is done, the hulls look great, amazing considering it is over 11 months since we anti-fouled them. I then have a shower as being in the engine room is always dirty work. We have sundowners and then I cook sirloin steaks and sausages on the barbecue. We go to bed at 2015 and read till 2030. We get up at 0500 and while I take Veto to shore, Kelly gets tea and coffee ready. At 0525 we head off from the mooring and Kelly logs on with Marine Rescue Sydney. She gives an ETA at Port Stephens of 1700 and a check in of 1200 at Swansea. We put out the screecher as soon as we turn once out of Pittwater. We are doing 6.5 knots with an engine on in 7-10 knots of south-westerly wind. Today we have to average about 6.2 knots to get there before sunset. The wind goes more southerly, so at 0945 we put up the spinnaker, the first time since last year’s disastrous run to Gloucester Passage. All goes well. The wind is 10 knots and we are doing 6.2 knots into a 0.5 knot current with an engine running. Off Norah Head we check in with Marine Rescue. 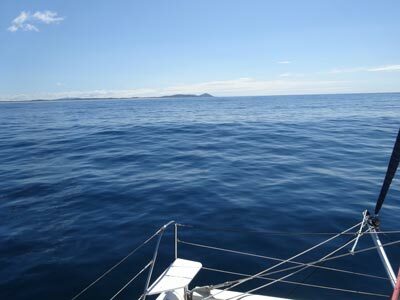 Soon we are doing 6.5 – 7.5 knots in a 13 knot south-easterly wind. There are not as many coal ships here as the two times we passed by last year. 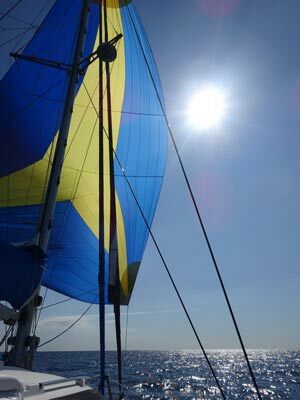 At 1230 we pull down the spinnaker perfectly (yahoo) as the wind has gone more to the west. We again pull out the screecher in 12 knots doing 6.5 knots. We swap to the genoa at 1400 when the wind goes to less than 60 degrees off our port bow. Today the starboard engine is running perfectly. 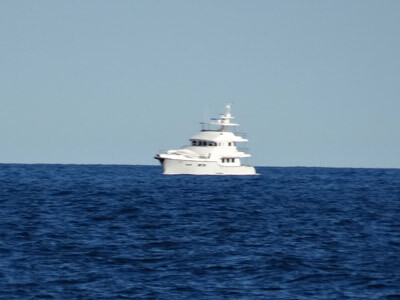 Another yacht left Broken Bay a bit before us and they have stuck right to the coast rather than following a straight line from Broken Bay to Port Stephens as we are doing. They get to Fingal Bay well before we do, perhaps they have not had any current doing this. The wind drops to 7 knots so we have to extend our logoff to 1730 (from 1700) and put on our second engine. We are doing 7 – 7.5 knots. 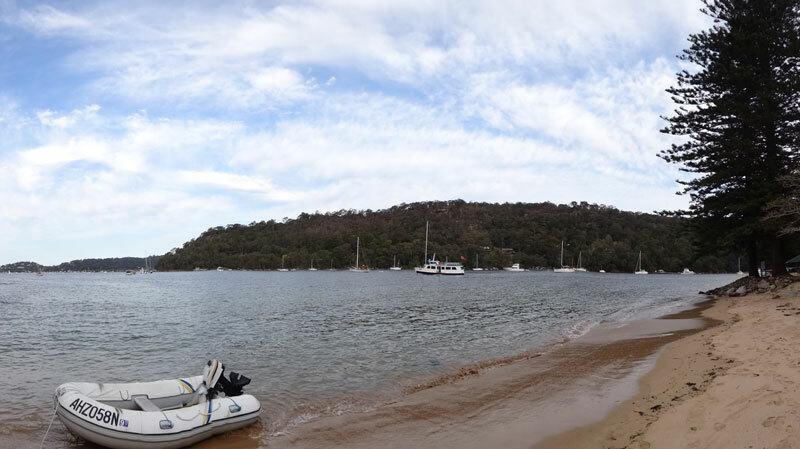 We get inside Port Stephens about 1710 and by 1730 are moored off Shoal Bay. We use a different public mooring to the ones we used the last three times we have been here as we have had lots of mooring knock on them (the tide seems to eddy around the eastern most ones). We are to the north-east of the wharf and this mooring causes us no problems. We take Veto to the beach and she has a great run. We have showers once back on Catlypso and then a late sundowners. Kelly makes curried sausages (using already cooked sausages) and I made steamed rice as we entered the bay. The wind is now 15 to 17 knots from the north-east. This is the direction the wind will come from for the next two days, so we will not be going anywhere as this is almost totally on the nose for the direction we have to sail. We go to bed at 2030. A good day’s run. 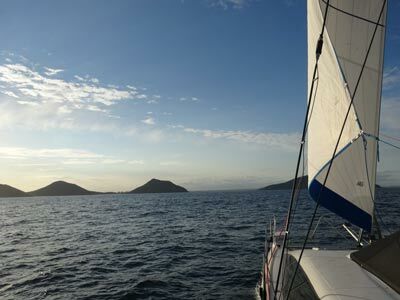 As mentioned, we decided yesterday to stay today and tomorrow in Port Stephens as there are northerly winds forecast. It was also 25+ knots for a while last night but it eased and turned west here before dawn. We get up at 0800 and go ashore for another long walk. Once back we have breakfast. A bloke called John comes over later from his flybridge cruiser. He wants to look at Catlypso as he is looking for a catamaran. He actually purchased a 45 foot Fontaine earlier this year but in the huge storm that hit the east coast of New South Wales in June it broke its mooring here and ran aground. We show him over the boat. I later do some work on our boat laptop, setting up some programs to enable us to download weather faxes using the HF radio. However, I cannot find the adapter plug so cannot test it. I also set up MS Outlook so I can receive weather GRIB files via email. We go to shore and buy some bread rolls and a paper. After lunch, we decide to motor across the bay (2.5 nautical miles) as the winds tonight are supposed to be stronger northerly and it will be more protected there. John also told us about two public moorings there. It only takes us about 30 minutes to get there. We grab one of the moorings off the beach at Winda Woppa. This is west of Barnes Rocks which are at the western end of Jimmys Beach. It is shallow, only 1.6 metres below our keels at low tide. This is a nice spot. Just after 1500 we go to the beach and walk to the minor entrance to the Myall River and back. We are back on Catlypso at 1620. I add 44 litres of diesel from our jerry cans to the main tank. We have sundowners and Kelly cooks chicken Maryland with vegies. It starts raining about 1800 and continues all night. We go to bed at 2100. It was very calm all night but it rained till 0800. we get up at 0830 and take Veto to the beach. We have breakfast and it starts raining again at 0910. it is still calm. The forecast is looking good for leaving tomorrow, probably very early. Kelly has some work to do, so I take Veto to the beach for another walk. We leave at 1145 and motor back to the southern side at Shoal Bay. However, the starboard engine is again slipping its v-belt, so we use the port one. Once back on the same mooring as two nights ago, we swap the belt for a different one. The one we take off has teeth and the new one is a bit narrower, has no teeth and is slightly less in circumference. Both have the same designation 13A0990. I also remove the port fine fuel filter which has had a slight leak for ages that I have not been able to stop. I find a new o-ring and refit it. This seems to stop the leak as when Kelly runs it at 2000 rpm I can feel nothing coming out. We have lunch and then go ashore to meet up with a diving friend, Laurie Klippel and his wife Doris. They are spending a few nights here on a holiday. We go to the pub and have a couple of beers. We have not seen them for a few years as he has not been diving much lately. We also came back over here for tonight as another diving friend, Mat Peeling is coming for sundowners. He arrives at 1630. Mat is now living up here but is still a member of our dive club. It is great to see him as well. He leaves at 1820 and Kelly makes chicken meatballs and spaghetti for dinner. We go to bed at 2030 as we have to get up early for a long run to Camden Haven. It was very calm overnight. We get up at 0400 and leave 15 minutes later. We log on with Marine Rescue with an estimated arrival time of 1700 and a sked at Forster of 1200. We motor out at 2400 rpm doing 5.2 knots with 0.75 knot current against us. Trying to keep out of the current as much as possible, we go inside Cabbage Tree Island and between Broughton Island and the mainland. At 0530 we put out the screecher. We are doing 7.3 knots in 22 knots of westerly wind. However, the wind soon drops to 12-15 knots and our speed to 6-7 knots. Daylight came at 0530 and at 0600 starboard engine goes to 800 rpm meaning the v-belt is slipping again. Bugger! Swapped to the port engine. At 0715 the wind hits 26 knots and we are doing 8.8 knots, but it is mostly 17-22 knots and a speed of 6.8 to 7.7 knots. 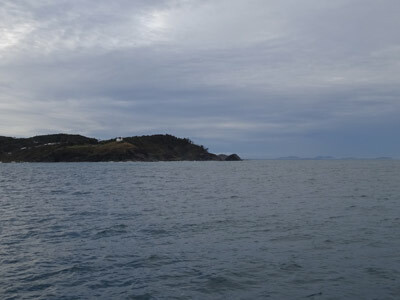 At 0810 we round Sugarloaf Point at Seal Rocks, going between Big and Little Seal Rocks and Sugarloaf Point. The wind is 20 to 25 knots and we are doing 6.2 knots without an engine. However, the wind soon drops so we have to put an engine back on to keep our speed up. At 0955 the wind goes easterly so we have to swap the screecher to the other side. The wind then drops so we pull in the screecher and have both engines running. Today we have seen lots of humpback whales, one breaching, and two lots of dolphins. At 1420 we turn off the starboard engine as the v-belt appears to have broken as we now have no revs showing at all. 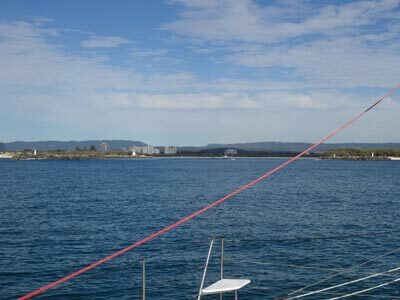 The wind later goes all over the place, varying from 5 to 15 knots and we have a current of 2 knots against us at times. We end up bringing in the screecher as it is just flapping around. At 1645 we enter the Camden Haven River, very flat at almost high tide. We motor up to Laurieton. Our friend Ian Gowan is down from Port Macquarie for a meeting and he has already phoned to say that the two spots on the wharf are taken. He and his wife Sharon are going to have dinner and drinks with us. We arrange to meet him near the wharf. We anchor at 1715 opposite the wharf. I transfer the remaining 66 litres of diesel from jerry cans to the tank. I also have to change the v-belt sometime later. I take Veto to the wharf for a run. Ian and Sharon arrive so I take the five empty jerry cans to shore and Ian takes me to fill them. We are having pizza, so we go and order from Big Brother (very nice – 2 for $25) and then fill the jerrys. When we get back to the wharf, I take Ian and Sharon and the fuel out to Catlypso. We have a few drinks and eat pizza. After dinner, Ian and Kelly help me change the v-belt. I put one of the brand new ones on. Ian and Sharon leave about 2000. Since we left home, the toilet has not flushed. Today Kelly put some bleach in it and the flushing is working. No idea what the problem was as it was pumping everything out as well as mashing it up. We go to bed at 2100 as we have another early start tomorrow. We get up at 0500 and while I take Veto to shore, Kelly makes tea and coffee. We leave at 0520. It rained during the night and it is still raining now. We have the radar going as the visibility is not great. The bar crossing is again very flat. Once outside we use one engine at the screecher to do 7 knots in 10 knots of wind. The wind is up and down, but mostly as above. 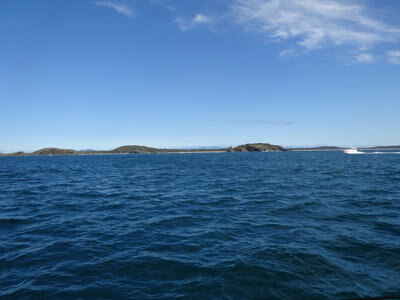 We pass Port Macquarie at 0750 and there are plenty of humpback whales around and even one southern right whale. At 0900 near Point Plomer we raise the mainsail. We are doing 7.5 knots with an engine running at 2000 rpm. It is now sunny. The wind later drops and at 1020 we pull in the screecher as the wind is less than 4 knots and behind us. At 1145 we check in with Marine Rescue Trial Bay, 0.75 nm east of Hat Head. We have 1.5 knots of current against us. South of Fish Rock the wind goes west for 10 minutes, so screecher out again, but then it goes east! Luckily it stays that way, 11 knots letting us do 7 knots against the current with one engine still on. At 1400 the wind goes from east to west and builds to 18 knots. We swap the screecher over and are now doing 8 knots without an engine on. The wind increases to 28 knots so we pull in the screecher and put out the genoa. We are still doing 8 knots. We head a bit towards the shore as it is getting a bit uncomfortable. At 1530 we pull in the genoa and drop the main as the wind is too strong for both. We then pull out the screecher and with one engine we are doing 7.6 knots. 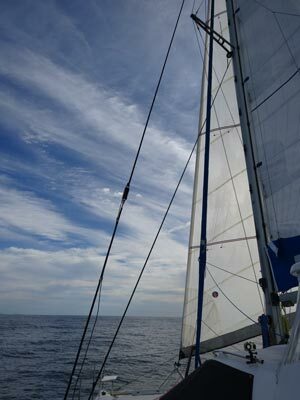 The wind then drops to 8 knots and goes north-west, so we have to swap to the genoa as it is less than 60 degrees. We motor with both engines on. 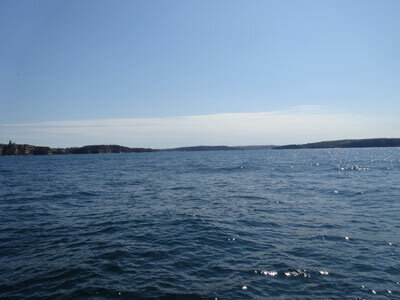 We round Korffs Islet and the reef east of that and at 1910 we anchor on the south side of the old wharf. We anchored here least year. This has been the second longest passage we have done, 86.45 nautical miles. I take Veto to the wharf for a run while Kelly makes dinner. Back on Catlypso we have some drinks, garlic bread and showers and then dinner. We watch the NRL semi-final between Broncos and Cowboys. A fantastic game, reminiscent of last year’s grand-final between them. It again goes into extra time and the Cowboys win again. The weather for the next two days is not good for heading north, with northerly winds both days and very strong tomorrow. We will stay here and on Monday head north, probably doing an overnight sail to the Gold Coast. It was very calm overnight and we get up at 0800 and take Veto for a walk. At this tide we can tie up Thunderbird 2 to the lower part of the wharf, but at lower tide it is too hard to get out onto the wharf. We walk to the IGA which is not far away and get some bread, rolls, orange juice and sugar. We drop into Jetty Dive on the way back and say hi to the owner, Mike Davey, who I have known for 20 plus years. We are back at Catlypso by 0920. There is also a petrol station close by as well as a liquor store (same business). There is also a laundomat at the marina or next to the IGA. As we walk back along the wharf we see that there are now two public moorings on the north side of the wharf. These were not there until the past few months apparently. We move Catlypso to the western one. Last night there were two yachts on these moorings but they have obviously headed south today together with a large cruiser. It is now nice and sunny and I sit outside reading the newspaper Kelly purchased. Sometime today a 68 foot Nordhavn power boat comes in and anchors to the south of the wharf. These boats are our idea of the perfect power boat. If we ever win Lotto, we would love to get one. This one is Karajas and was built in 2014 and is based in Sydney. At 1200 I hear the P&O cruise liner Pacific Jewel call someone and I turn on the laptop and see that the ship is heading straight at Coffs from well off shore. 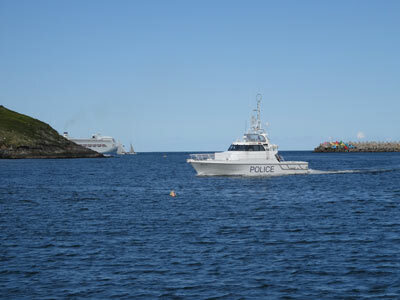 At 1225 they call Coffs port control (there is no such thing) and Marine Rescue answer. We deduce that a person is sick on board as it is called “a situation”. The water police are informed and advise they will depart 1315 with ambulance officers. 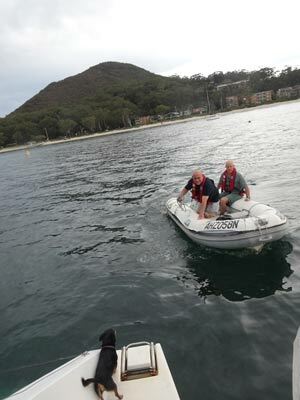 We can only hear one side of the conversation as Marine Rescue NSW has set up some VHF duplex channels (19 for example) using a cheaper version than normal. Normally a duplex channel operates as a repeater station, rebroadcasting everything it receives using another radio (or a special system that operates like two radios). However, this setup only uses one, with the transmit and receive channels swapped. Marine Rescue broadcasts and receives direct from this radio, rather than using one in their base (this is not how it actually works as it is all ROIP – radio over IP – using computers). Anyway, this means that you can only hear the Marine Rescue side of the conversation. At 1320 the police boat Fearless left with the ambulance crew on board. Pacific Jewel was by now just off the harbour entrance. The police returned within 30 minutes with the sick person. Adventure at Coffs! 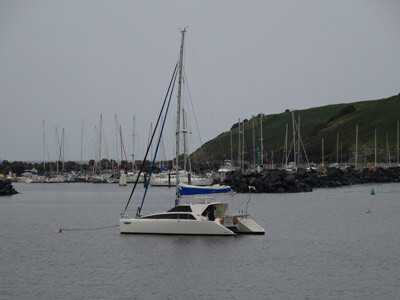 Earlier I went over to a smallish (9 plus metre) trimaran anchored near us last night. It is really quite small and Kelly and I felt a bit sorry for them, so I invited them over for sundowners, I would supply beers. Guy and his son Scott said they would come. At 1515 we went into the marina to have a look at the damage caused by the June storm. The marina, breakwall and other infrastructure was smashed by the huge seas that came right over the wall into the marina. The work to repair everything is well underway, with new boulders put in place and work ongoing to fix the marina pontoons etc. You can see where huge boulders and concrete blocks have been moved, such was the power of the seas. There is also a new public wharf under construction near the water police office. After this we came back and at 1700 I went and collected Guy and Scott as they only have a small inflatable that they would have to blow up and row over. 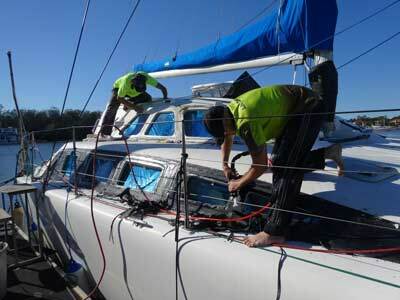 Guy purchased the boat called Big Bird in Pittwater and is taking it back home to the Moreton Bay area. The boat was designed by Tony Grainger who also designed our Lightwave 38. 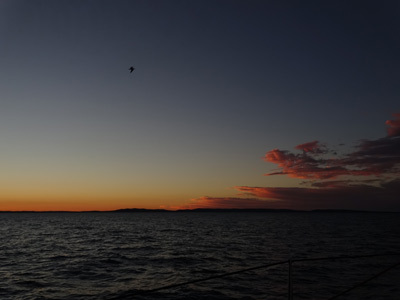 They tell us that they left a day behind us but sailed on the two days we decided to wait in Port Stephens for more suitable winds. They have had a rough trip, so beers and nibblies are really a luxury as they have no refrigeration. They will also leave on Monday morning so we make plans to stay in touch by VHF. I take them back to their boat later. Kelly cooks a flat lamb and vegies for dinner. We then watch the Sydney Swans win in the AFL semi-finals and the Raiders in the NRL. We are in bed by 2130. 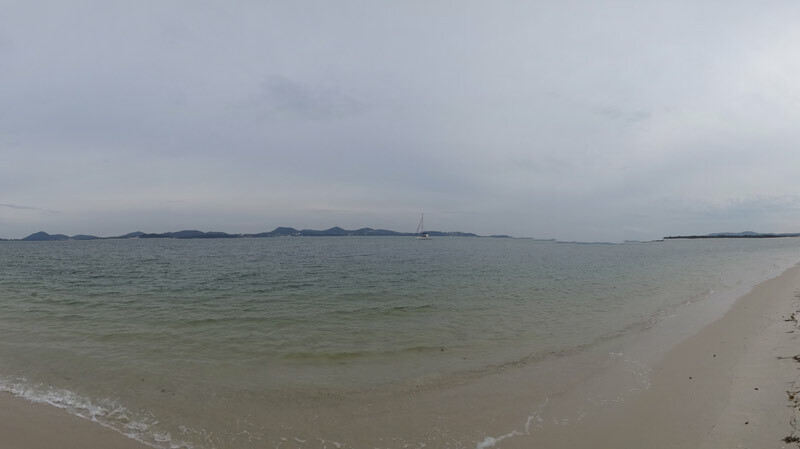 It was not too windy overnight (same as yesterday) but it rained from dawn till 0930. Accordingly we do not get out of bed till 0915 and I take Veto to the wharf for a walk. After this we have breakfast and watch hundreds of people doing a fun run which comes out along the wharf for at least two legs. This finishes at 1100. At 1200 we go into the marina and walk to get some more beer and also some fish and chips for lunch. I went and asked Guy if he wanted to come with us and he goes to the IGA for some food items and also gets fish and chips for him and Scott. We go back to Catlypso and Kelly gets our lunch ready while I take Guy back to Big Bird. We are back by 1320. Later I add 44 litres of diesel to the tank making it almost full. It has been very windy this morning, but by 1230 it starts easing a bit. 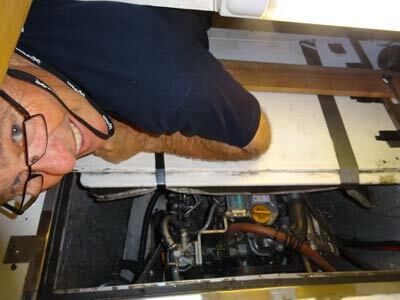 We checked the starboard bow compartment and found some water in there. This has come from the leaking window/s. We have to remove all the lifejackets and other things there and dry them out. Luckily it looks like they have only gotten wet recently so there is no mould. 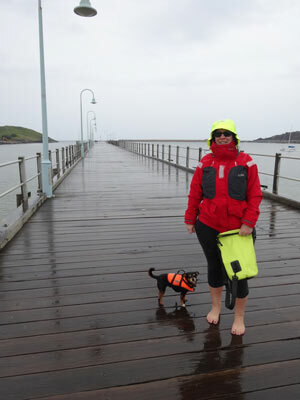 At 1700 I take Veto to the boat ramp as the tide is too low for me to safely get onto the lower section of the wharf. It is again raining a bit. The wind is over 20 knots although it later drops to under 10 knots. We have sundowners and dinner of T-bone steak and sausages. We read and are in bed by 2030. 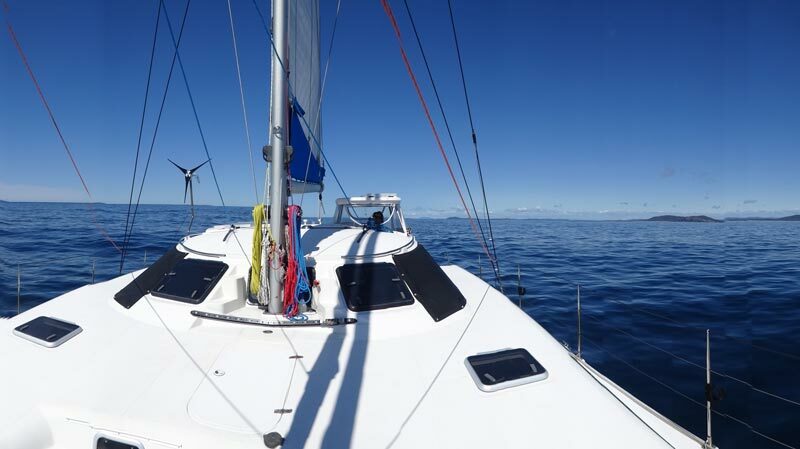 The weather forecast is still good, so we are going to sail overnight to the Gold Coast. 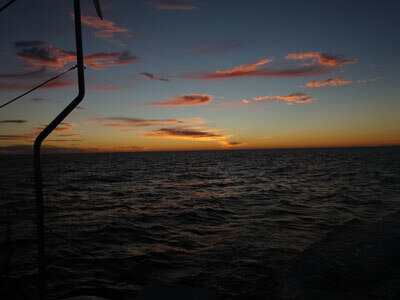 The wind should be mostly 8 to 12 knots westerly, with perhaps some south in it at times. 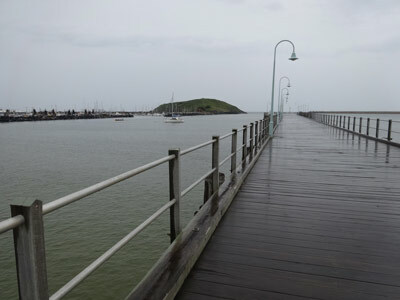 There is no point us leaving too early as we need to be at The Seaway at the Gold Coast near high tide which will be about 1030 or so. We get up at 0600 and find the wind has calmed off since we went to bed and also moved to west. 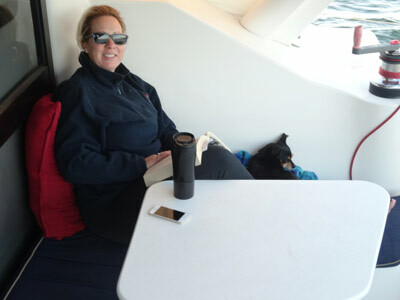 While I take Veto to the wharf, Kelly makes tea and coffee. We pull up the main while still at the mooring and then at 0635 we motor out of the harbour. Once outside we pull out the screecher and with one engine on we are making 5.6 knots in 5 knots of wind and against a slight current. We speak to Big Bird and find they left about two hours before us. We hear Karajas log on for a trip to the Gold Coast. As their cruising speed of 8 knots is not much more than ours, we will likely see them for most of the trip. The seas are very calm so at 0845 I have a hot shower since we have not had one for three days. Kelly then has one and also washes her hair. The wind is now 10 knots south-westerly and we are doing 6 knots. There are plenty of humpback whales again today. Later the wind goes north-west so we have to pull in the screecher and put out the genoa. 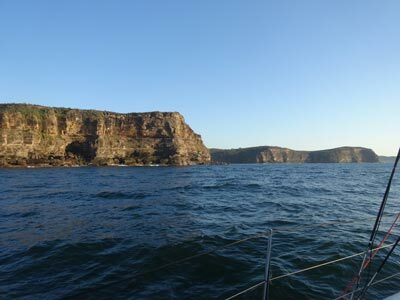 At 1010 when off North West Solitary Island we swap back to the screecher as the wind is now 15 knots and more westerly. We turn off the engine. We are doing 6.5 knots into a 1 knot current. Thirty minutes later we have to put the engine back on as the wind has dropped back to 8 knots. At 1150 we check in with Marine Rescue Wooli. After this I try to dump the holding tank but after it does not flow out, I find that the thru-hull spindle has broken and it has not opened. Bugger! Not sure how this can be solved easily. At 1225 the wind is back up to 17 knots so we turn off the engine again, we are doing 7.7 knots. This does not last long so the engine is back on again. Big Bird advises Marine Rescue that they are now probably heading to the Gold Coast rather than Yamba as they first advise. Over the coming hours we are able to turn off the engine but then have to turn it back on when the wind drops. The wind is really all over the place. About 1600 Karajas finally passes us. For a long time they were level with us when we were doing 7.5 knots or so. At 1730 we prepare for the night. We pull down the main and just use the genoa and engine. We check in with Marine Rescue Cape Byron and will do this at 2100, 0000 and 0300 during the night. We go to our overnight watch which means lifejacket on if outside the cabin and life lines in use if we move outside the rear deck. Kelly does the first watch and I heat up our dinner in the microwave. Soon after the wind increases dramatically to 20+ knots (supposed to be 8 to 12). It hits 28 knots maximum and it is now quite rough. I take over a bit early from Kelly at 2045 having gotten no sleep as Veto has been very nervous due to the very lumpy seas. Kelly takes over early from me at 2330 as she has hardly slept. The wind has averaged 22 to 26 knots, with a maximum of 29.6 knots. 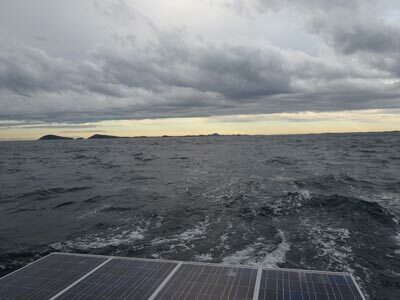 We pass Cape Byron at 0030 and soon after it calms off a bit as the wind is now a bit more behind us. I go to our cabin with Veto and we both manage to get some sleep, she is certainly a lot calmer in here. I slept from about 0100 to 0300. Kelly advises that she wants to stay on duty till 0500 and I sleep most of the time. At 0500 I take over. It is a lot calmer now and the sun is almost up. Kelly gets a good sleep, but not for a long time. At 0530 we pass Cook Island and the reefs off it. There are more whales around, including a few breaching. The wind is now southerly at 15 knots and it is quite a nice sail. At 0610 I contact Big Bird who report they are ahead of us. 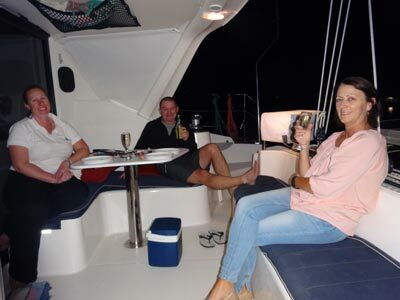 We have not heard from them since midnight and thought they may have anchored at Byron Bay. At 0740 the wind goes north-west so we have to pull in the sails as this is right on the nose. 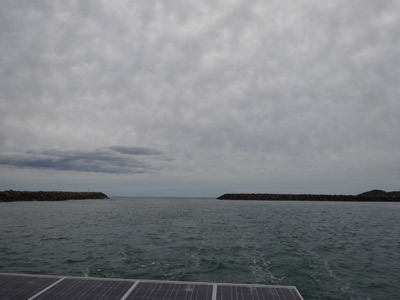 We motor the rest of the way and at 0855 we enter the Gold Coast Seaway. The bar is flatter than for our previous three crossings. We log off and motor at 8 plus knots on an incoming tide to the Coomera River and then up to Coomera. Karajas is now only 50 metres ahead of us as we have been catching it since dawn. At 1040 we tie up to the Lightwave wharf and speak to Roger Overall (owner of Lightwave) about our repairs. We unload all our things and put into Kelly’s car which I drove up here from Sydney almost two weeks ago. They will start repairs on Thursday as tomorrow a lot of rain is forecast. We drive down to Southport to Kelly’s Mum’s place where we will stay the night. Early in the morning I took Kelly to the airport and she flew back home to go to work. 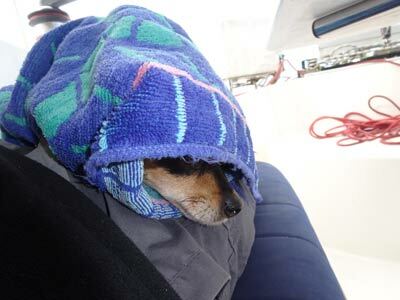 It rained all day so nothing done on boat. I went early back to Lightwave and they had already removed all five windows on the starboard side. We had thought that the window tinting might be hard to remove, but it was quite easy. For the top two windows on the saloon, it came off in one piece, probably because these windows had a shade cloth material on the outside. The other three were not as easy, but it still came off without too much work. I also shut all the thru-hulls, dropped Thunderbird 2 into the water and ran its engine, disconnecting the fuel line so it ran till there was no fuel in the carburettor. When I pulled it up I made sure it was angled with the stern down and the bung out so the rainwater from yesterday ran out and any more rain will not pool in it. I also attempted to get a new latch to replace the one on the anchor locker which broke on the way up. The handle broke off so we can only open it by using a pair of multi-grips. Unfortunately, the size used appears to be unique to the one brand (75 mm across and 62 mm hole). To make it worse, the chandlery at The Boat Works finds out that the white one will not be available till 17 October! Slack importer that is for sure. I will order one before we come back up to the boat. The windows went back on later in the day. That afternoon they also removed the five windows from the port side as well as the small window behind the mast. I again went to Lightwave this morning. The port windows were already cleaned and the window section of the hull/deck prepared. While I was there they started to install the windows. I did a few more things, including downloading from our laptop the tracks for the trip. Once this was done I went over to The Boat Works. Another Lightwave 38, Red Undies, owned by Ken and Judi Brookes. Ken has been in hospital for the past week with a severe infection caused by a cut on his leg. Today Red Undies is supposed to be relaunched after anti-fouling etc. However, Ken is supposed to keep his leg up and Judi had a hip replacement recently. I have offered to assist them moving the boat to the marina near Seaworld. The boat is put back in the water and I drive it down the Coomera River and the Broadwater past the Seaway to the marina. I let Ken park it! Judi then drives me back to The Boat Works so I can get our car. I then head back to Kelly's Mum's place and then drive to Lennox Head (in NSW) where I stay the night with my old work friend and diver Joanne. Tomorrow I will drive the almost 800 kilometres back home. The adhesive used to fit the windows (Dow Corning 995) needs quite a curing time, up to 15 days. Therefore Catlypso will not be able to be moved for a while. She will stay at Lightwave on their wharf for the moment. After this she will be hauled out so the toilet dump thru-hull can be replaced. A few other things will also get done while here, including repairs to the rear deck shade and weather curtains (the upper and lower zipper sections broke last year). Lightwave will also cut a hole under the freezer section to access the driver seat post which is loose. This will be tightened and a hatch door put where the hole is cut. This will give us some more storage space. 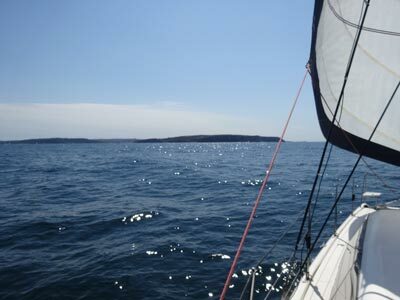 The weather was not perfect for sailing, but we had a pretty good run up from Sydney. 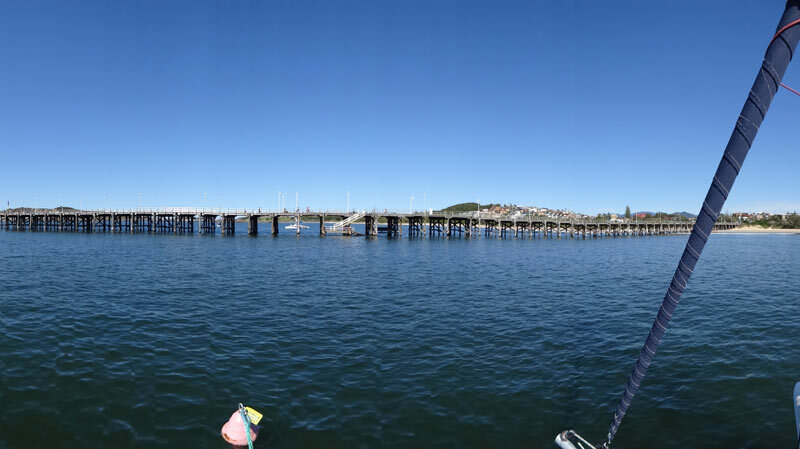 It is a pity that the safe ports are so far apart that you must run an egnine for most of the time to average the speed needed to get into port before dark (or across the bar at high tide). Apart from the six hours overnight last Monday, we did not have winds or seas that were too bad.